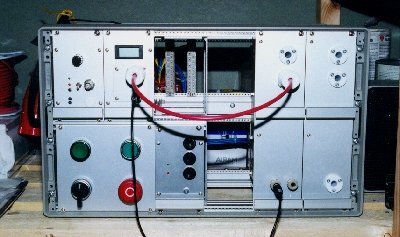 The power supply to be constructed within the Thor project is not a stabilized DC voltage source but can the better described as a Capacitor Charging Power Supply (usually referred to as CCPS in technical literature): the capacitor to be charged is the one in the Tesla Coil primary circuit. A charging cycle begins after a triggering signal pulse is given: when the voltage on the capacitor reaches a predefined value, the CCPS goes into an off-state, waiting for the next trigger pulse. A switching power supply is employed, using four IGBTs connected as full-bridge. The series resonant load topology is particularly suitable for capacitor charging because it behaves as a constant current source: charging time is thus boosted and no special precautions are needed to limit current surges at the beginning of the charging cycle. 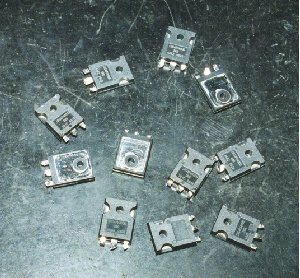 Additionally, by properly matching resonance and switching frequencies, the IGBTs close and open at zero-voltage and zero-current time, therefore minimizing switching losses. 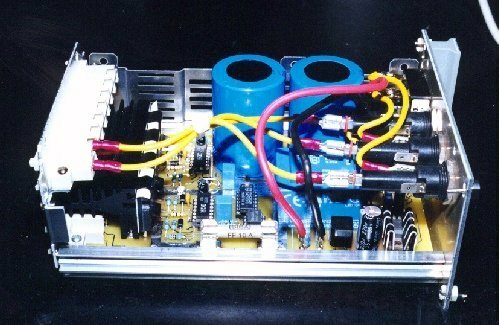 For a basic description of the power supply topology, operation and benefits, please read the Series Load Resonant Power Supply basics page. A controller, providing switching pulses and controlling the capacitor charging voltage. Based on the Unitrode UC3860 chip. Switching frequency is 50 kHz. 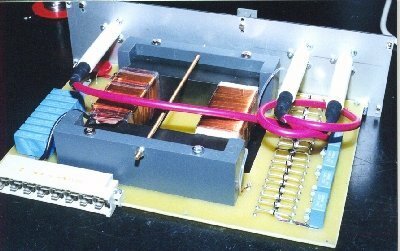 An high-voltage probe, based on the HCPL-7800 isolation amplifier. Used to measure the capacitor voltage. Four power drivers, featuring each four 1200V 35A IGBTs connected as a full-bridge. Drived by the controller. Four HV transformers. Primary 560V, secondary 5 kV, 1.25 kW each. Drived by the four drivers. Using a double ferrite U-core Philips U100/57/25-3C90. Custom design. The voltages provided by the four transformers are individually rectified by a 7 kV 3 A diode bridge and then connected in series to provide 20 kV 5 kW total. The resulting voltage is used to charge the primary capacitor to a rate of 500 charges/s maximum.